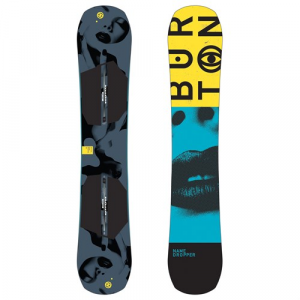 With an off-axis Squeezebox core, the 2016 Burton Name Dropper snowboard is soft and asymmetrical. In fact, Burton calls it their Filet-O-Flex core profile. We found it to be an amazing jib snowboard out of the wrapper. 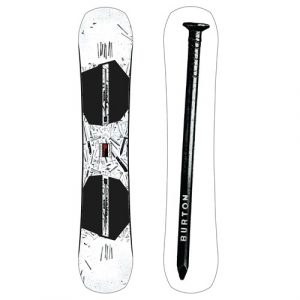 Winner of our Nudder Budder award, the Burton Name Dropper was easy to butter and press. No need to claim when you’re rolling with the anatomical awesomeness of this park-tweaked performer. Let your riding speak for itself with the Name Dropper’s next-generation, park-tuned performance. Off-Axis means all of its key ingredients, from the edges to the soft-flexing Filet-O-Flex core profile, match the angles of your stance for enhanced grip, smoother takeoffs, and stomped landings. Flat Top pairs underfoot stability with the forgiving feel of rocker at the tip and tail, while the addition of effortlessly flexing Off-Axis Squeezebox Low enhances the overall soft, buttery, and jibby feel.